The potato version of this recipe used to be one of our go-to's when we were having people over for dinner. I loved it because I could make the "mashed potatoes" the night before, assemble the casserole in the morning and then just have to bake it when guests arrived. And everyone loved it. So I decided to clean it up by replacing the white potatoes with mashed cauliflower. I made this yesterday- a day we hadn't eaten great - clean but not enough veggies and too many nuts and seeds. So I deliberately tried to keep the high fat ingredients to a minimum and it still tasted great. Feel free to replace the plain Greek yogurt with butter, sour cream or cream cheese. Also, you can add more cheese and bacon on top if you want to really impress someone. 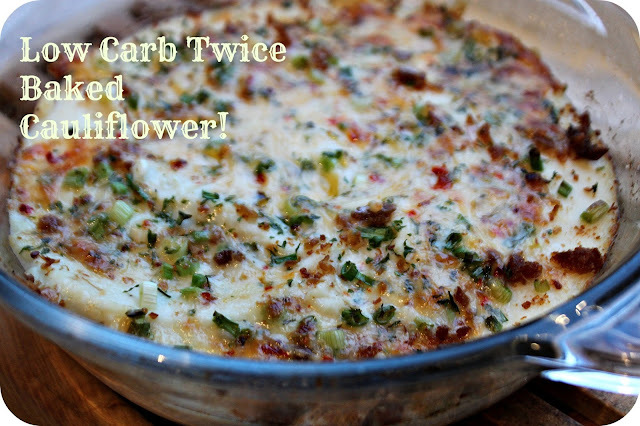 Hubby is still iffy on mashed cauliflower and he loved this so its a keeper! Place cauliflower in a large pot covered with water. Bring to boil. Reduce to a gentle boil and cook with lid on for 8 - 10 minutes. Cauliflower should be tender but not mushy. Remove from heat. Drain well. Put the cauliflower back in pot with lid on and let stand for 5 minutes. This ensures the cauliflower doesn't get watery. Don't skip this step. Place cooked cauliflower in the food processor with Parmesan Cheese, Yogurt, salt, pepper, garlic powder and parsley. Pulse until it becomes whipped/consistency of mashed potatoes. Place mashed cauliflower in a greased casserole dish. Top with onion, bacon and cheese. Bake for 15 minutes until heated through and then broil for a couple of minutes to crisp up cheese. If you make the mashed cauliflower ahead of time and it has been refrigerated bake for 30-35 minutes and then broil for a couple of minutes. Delicious! This would be amazing as a topping for Shepherd's Pie. do you have nutrition facts on this dish? i'd love to try it! I don't have a food processor. Can I use a manual potato masher on the boiled cauliflower? Sorry - don't think that will work. I've tried it before and it doesn't get smooth. But let me know if you have better success with it. I have always used a hand mixer...works perfectly fine. This looks wonderful! I love mashed and creamed potatoes. Can't wait to try your recipe. 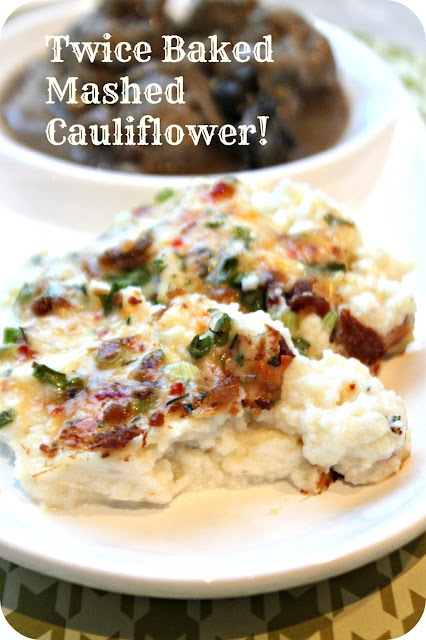 Yummy, nothing better than cauliflower to replace potatoes. I don't have Greek yogurt ... what would be a good replacement? Yes! Worked well with sour cream.